The baddies of the DC Universe just can't catch a break. The disappearance of Superman, Batman, Wonder Woman and the rest of the Justice League should mean planet Earth is open for business as far as its resident ne'er-do-wells are concerned. Alas, no sooner do they disappear than a gang of replacements from Earth 3 show up. The Justice Syndicate - the suspiciously familiar Ultraman, Owlman, Superwoman and their pals - are a tad (read A LOT) less well meaning than their counterparts, however, and the DC villains just aren't going to let this racket stand. What follows is an epic and bad-to-the-bone team-up of the DC Universe's most corrupt characters, with the likes of the Joker, Lex Luthor, Harley Quinn and Darkseid accompanied by more obscure sorts such as Calendar Man and Condiment King (no, we didn't make him up). In a departure from previous LEGO games, however, your own custom character isn't relegated to open world exploration and takes centre stage in the story mode. You can build them from the ground up, including choosing their powers. Furthermore, the ability to acquire new abilities as you go means you won't need to swap around characters as often as in other LEGO games. Gameplay is, as ever, a light blend of platforming, puzzle solving and combat, with plenty of laughs sprinkled throughout. That's helped, of course, by the inclusion of familiar voice talent such as Mark Hamill playing the Joker. 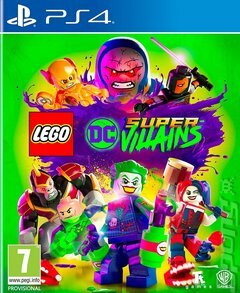 Beyond the main game you can explore iconic locations such as Metropolis, Gotham and Smallville, completing side missions for other villains and generally causing chaos. You might, of course, attract the attention of the authorities (you're a criminal, after all) and, in a nice touch, find yourself in a Grand Theft Auto style 'wanted' challenge.